[update] @robb suggest to just increase the vdisk size in proxmox; and @fausp give detailed steps to increase the LVM partition inside the NS vm. How can add a new virtual disk, to mount as the /var partition, so it can be used to store the soon to be folders for my users, and to add more modules later. Or (Hope not) I need to re-install the full nethserver and re-create the AD? Maybe I can backup and restore all my users and groups to accomplish this task? Of course I can delete and recreate the shared folders. In case I need to reinstall everything. What is not so clear to me is how to tell to NS that I want to use one virtual disk for the root partition and other disk for the /var partition. I really don’t understand how to tame the anaconda on the disk setup. Be careful, you should know what you’re doing as you may harm your system with these operations. That’s an official migration way and will work but as you have virtualization you don’t really have to reinstall. 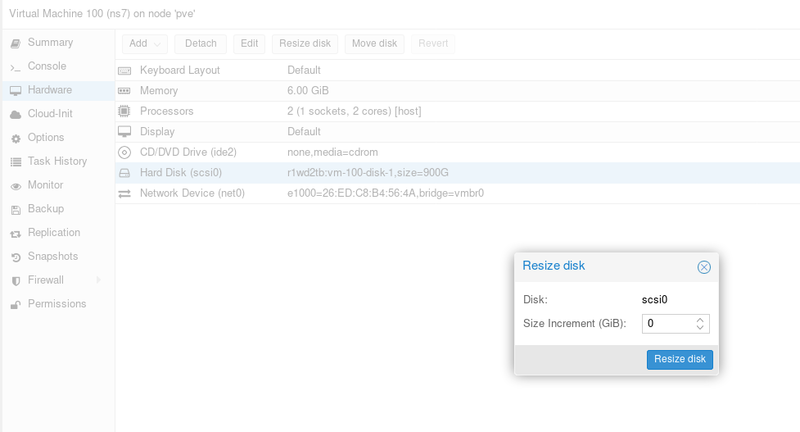 If you use proxmox, as said by @mrmarkuz, you have to create that disk in proxmox. Then you can mount the new vdisk in your NethServer install as /var/lib/nethserver so your server data (shares and homedirs) will be on a separate vdisk. But to be honest, since you are using proxmox, what benefit do you think to gain by creating an extra vdisk for data? Taking a snapshot and using your usual backup options in NethServer will at least be as safe as having the extra vdisk. Keep in mind that the extra vdisk is in the same ZFS pool as your vserver. So if your ZFS pool breaks, it doesn’t matter if you have an extra vdisk or not for data. I have more to learn with your posts. maybe I wasn’t thinking correctly, I got some pressure here to get this server running at the first shot. With some little practice before of course, but I really want this to be the one in production. I forgot about LVM; that I’m rarely touching ever; that’s why I asked how to add the disk in NS. What If I go for the next option? Increase the vdisk size of then VM from 50GB to 500GB (so I can take vm snapshots, etc in proxmox). NS can detect and use the new size? I need to do something in NS to use the new size? Now the question is… the partition to increase is " /dev/mapper/VolGroup-lv_root" right? Yeah I already love it. I tested before the “resize disk” option and it works, but not using NS. Too many projects, options and work is a little overwhelming to keep the pace. The backup is done, I keep reading your comments. Thank you! It works for NethServer too… A few months ago I had to resize my main VM from 500GB to 900GB. It went flawlessly. I increase the size, with the VM/NS off. Something weird, if i try to shutdown the NS from the “Administration | Shutdown” or in a terminal (using ssh or in the console in proxmox). Then in Proxmox I look the vm sumary it shows running, I wait some minutes, refresh the page and still shows the vm running. I need to click on the button to “really” shutdown the NS vm. ¿Maybe something is broken on my NS? /edit1: I need to wait for almost 5 minutes to see the vm off. I’ll try to reboot the proxmox and see if something change about the new vdiks size. Did you activate the Qemu Agent under Proxmox? ops! Not installed… I’ll do right now. Thanks @fausp, I’ll read that. I wonder if I just crippled my NS: I have installed the acpi/services a few hours ago; and right now the qemu-guest-agent. Now, I try to shutdown the NS from proxmox and no, the vm is still running. /edit: The wiki says: "if the qemu-guest-agent is correctly runnning in the VM, it will return without an error message. " its official, I’m tired. Lets say we have a NS7-VM under Proxmox 5.x and we want to increase the disk size from 500 up to 2000. “d” will delete the partition, then data will be gone? Testing right now (backup is made); how can I learn if I don’t broke things right? Size of logical volume VolGroup/lv_root changed from 46.99 GiB (12030 extents) to <497.00 GiB (127231 extents). Logical volume VolGroup/lv_root successfully resized. I need to “reset” from proxmox.